Confused about how to make an Indian Railways reservation for train travel in India? Indian Railways requires reservations on all classes of travel except general class. There are a few ways you can go about making a reservation -- online, or in person at a travel agency or Indian Railways booking counter. Online reservations are carried out via the cumbersome and slow IRCTC Online Passenger Reservation website. Alternatively, travel portals such as Cleartrip.com, Makemytrip.com and Yatra.com now offer online train reservations. These websites are much more user friendly, although they do levy a service charge and not all trains are displayed. As of May 2016, foreign tourists are able to reserve and pay for tickets on the IRCTC website using international cards. This is facilitated through Atom, a new online and mobile payments platform. However, foreigners must have an account that's been verified by Indian Railways. This can now be immediately completed online with an international cell phone number and email address, and by paying a 100 rupee registration fee. Also, do note that Indian Railways now allows foreigners to make online bookings under the Foreign Tourist Quota, effective from July 2017. This step by step guide will help you through the reservation process using Indian Railways facilities. 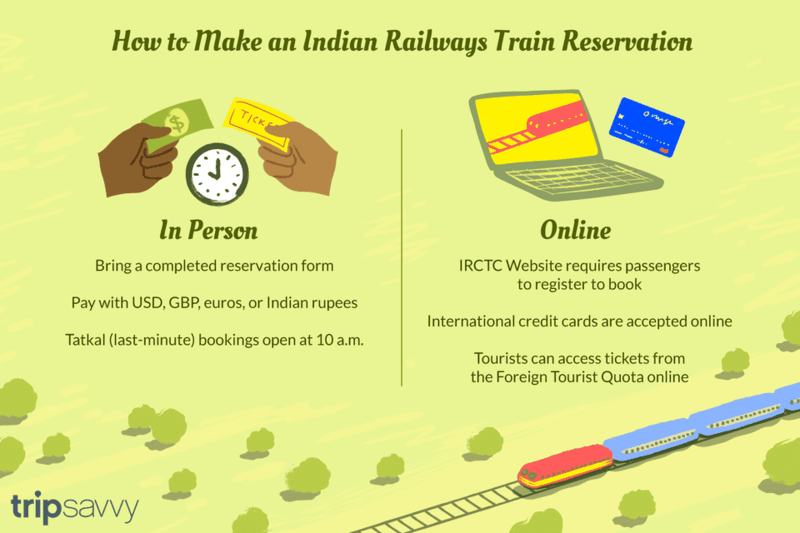 If you intend to book online and haven't already registered, firstly go to the IRCTC website and register (here are the steps for Indian residents and for foreigners). Indian Railways has introduced a new "Plan My Journey" facility on the IRCTC website. Click on it, on the top left side of the screen after you've logged in. Enter the details of the station you want to depart from, the station you want to travel to, and your journey date. If there are no trains running directly between the stations you've selected, you’ll get an error message and will need to try some different station names. Otherwise, you’ll be presented with a list of trains. Trains can be refined by type and class of travel. Select the desired train and class you wish to travel by (and quota if relevant), and check the availability of beds. You can also see the train fare. If there's no availability on your particular train, it will show as Reservation Against Cancellation (RAC) or Waitlist (WL). If the status is RAC, you can still book a ticket and you’ll be given a seat on the train, but not necessarily a bed unless there are enough cancellations. If you book a Waitlist ticket, you won’t be allowed to board the train unless there are enough cancellations for a seat or bed to become available. Once you've found a suitable train to travel on, click on the "Book Now" option under "Availability". You will be taken to the ticket reservation page, with the details of the train you selected automatically provided. Fill in the passenger details, and make payment. A similar process can be carried out, without needing to log in, on the Indian Railways Passenger Reservation Inquiry website. Click on "Seat Availability" at the top of the screen. An Indian Railways Trains at a Glance timetable is available to assist you, although it requires quite a bit of navigating! Once you've found a suitable train to travel on, make note of its name and number. Log on to the IRCTC website. If you already have your train details and you're an Indian resident, click on the "Quick Book" tab on the top left side of the screen, next to "Plan My Journey". If you're a foreigner, click on the "Services" option on the left side of the menu at the top of the screen, and select "Foreign Tourist Ticket Booking". Enter all the required train details. Select e-ticket (electronic ticket) and click on "Submit". Complete the electronic reservation form and then scroll down to the "Payment Option" section at the bottom of the page. Choose how you want to pay and click on "Make Payment". If paying by international credit or debit card, select the ‘International cards power by Atom’ option under ‘Payment Gateway/Credit Card’. Your transaction will be processed and you’ll be provided with a booking confirmation. Print this out and carry it with you when you travel. For more information refer to this IRCTC E-Ticket Booking Guide or Quick Ticket Booking Guide. If you're booking over the counter, print out the reservation form. Complete the form and take it to a reservation office. Alternatively, you can obtain a reservation form at the office and complete it there. If you're a foreign tourist, try to go to one of the International Tourist Bureaus in major cities. These places are much more efficient and customer friendly. Be aware that you must pay with US dollars, UK pounds, Euros, or Indian rupees and an Encashment Certificate if purchasing a ticket there. All reservations, made both over the counter and online, are assigned a 10 digit PNR number. If you have a RAC or WL ticket, you can check the status of it on the IRCTC website by clicking on "Check PNR Status" under "Enquiries", and then entering your PNR number. Cancellations happen often, particularly in the 24 hours up to departure. If you’re waitlisted, you’ll have the best chance of getting a bed in sleeper class as the majority of beds (and therefore cancellations) are in this class. Find out: Will Your Indian Railways Waitlist Ticket Be Confirmed? The IRCTC website is closed for maintenance daily from 11.45 p.m. until 12.20 a.m. IST. Services are unavailable during this time. The "Quick Book" option is disabled from 8 a.m. to noon. Choose "Ticket Booking" under "Services" instead during this time. Bookings should be made as far in advance as possible (up to 120 days before departure), especially during the busiest traveling times. Otherwise, you’ll need to be prepared to be flexible about your travel dates and times, and class of accommodation. You may even find yourself on the waitlist, as demand greatly exceeds supply. It's recommended that you book your tickets online to avoid the often frustrating Indian bureaucracy and disorderly crowd. However, the IRCTC website can be temperamental. It's common to get error messages right at the end, at the payment phase. If you happen to get an error message (such as "service unavailable"), try refreshing your browser or go back to the start and re-enter your transaction. Patience is the key here. Sometimes the station name doesn’t reflect the place name (for example, the main railway station in Kolkata/Calcutta is called Howrah), so it pays to do a little research. You can do this by using the Indian Railways Trains at a Glance timetable. Indian Railways operates a number of quota schemes. Last minute bookings are allowed through a "Tatkal" Quota on some of the most popular trains, whereby beds are released for reservation 24 hours in advance (previously 5 days). Foreigners can avail of a special Foreign Tourist Quota, which can also help in getting a bed during peak times. The availability of both quotas can be checked when you check the availability of your desired train on the Indian Railways Passenger Reservation Inquiry website. Taktal bookings open at 10 a.m. Follow these steps to make Tatkal bookings online. Details of train name and number, boarding and departure points, and class of travel. Passport or other suitable identification. Credit or debit card (for online bookings). Reservation form (for over the counter bookings).